You can journey back to the Nineteenth Century on a tour of this fully-restored mansion full of period furniture and incredible nature-themed artwork. If you are a history buff, nature enthusiast, art lover, or enjoy strolling through a lush tropical garden, then this is the tour for you. Almost fifty years ago, this beautifully-designed building was scheduled for demolition. In 1958, the Mitchell Wolfson Family Foundation stepped in and saved this unique treasure of Key Wests architectural past. The building was then fully restored to its past glory and has served as an attraction for educational and historical objectives. Perhaps the most interesting attraction at this house is the collection of original drawings and paintings by the world-famous wildlife artist and cataloguer, John James Audubon. Audubons exquisite naturalist paintings of wildlife were used to document an array of species, especially birds. You can see his amazingly realistic renderings of wildlife indigenous to the Florida Keys. The original artworks, like the house, date back to the Nineteenth Century when Audubon was dedicated to cataloguing as much wildlife as he could. The interior of this grand Victorian is decorated in order to give visitors the feeling that they have stepped back in time and have entered an authentic Key West residence in the Eighteen Hundreds. After viewing the beautiful artwork and gorgeous antique furnishings in the house, you can step outside and stroll through a splendid garden area flourishing with an array of indigenous plants. These fabulous grounds cover an entire acre of blooming plants, including rare orchids and bromeliads. 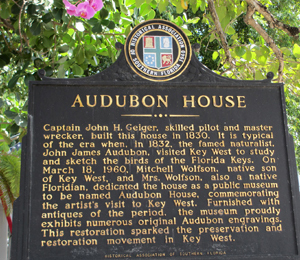 I have been to the Bahamas many times, but Audubon House and Tropical Gardens is one of my favorite trips! It includes everything that everyone should do here. As a Bahamas veteran, I can say only the best about this experience!